The tour prompts me to review the Catalogue of the tapestry project of the television programme. I'm really pleased to have been sent a copy of the book of The Vanity of Small Differences for review. Front Cover of the book of the exhibition of the tapestries arising out of the television series! The Vanity of Small Difference is a very important piece of contemporary art - which was conceived as a public work of art. It comprises six Tapestries listed below together with links to Grayson Perry's explanation of what the tapestries are about. The piece explores British taste. It's a contemporary version of Hogarth's 'Rake's Progress' and also reprises classic artworks (puns in the titles of tapestries provide clues!) in contemporary form. It all started with a safari around UK. Grayson Perry visited different groups of people - in Sunderland, Tunbridge Wells and the Cotswolds - which resulted in a BAFTA award-winning Channel 4 series ‘All in the Best Possible Taste with Grayson Perry’ (2012). His visits to places strongly identified with social classes investigated the taste of the different tribes of people in terms of class and social mobility and unearthed more than a few surrprises. The other thing you need to know is that Grayson Perry is very intelligent, acutely observant of contemporary mores - and finally, he's truly astonishing in the way in which he manages to be both very articulate with very accessible. I'm a huge fan! 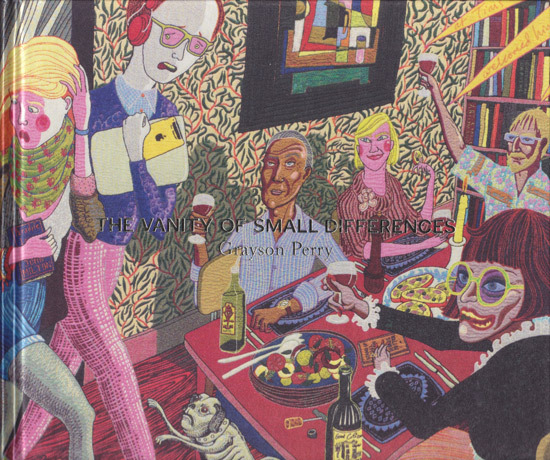 Synopsis: This book is the catalogue of the exhibition of The Vanity of Small Differences - an iconic piece of contemporary art based on research by Grayson Perry into contemporary taste, social class and class mobility. It tells the story - and shows us the processes - of how he developed tapestries telling the story of Tim Rakewell and his progress through life to his death. The name is a link to the Tom Rakewell of the Rake's Progress. The book explains how the tapestries came about and provides a commentary on what they reveal. Summary review: HIGHLY RECOMMENDED: This is an essential guide to a multi-layered, culturally rich and very important set of tapestries. A contemporary tale, an iconic artwork - and an interesting story about how the tapestries were produced plus excellent publication values all combine to make this both a very interesting and a very high quality publication. a great read - in terms of the essays. A stronger sense of the morality tale which underpins some of the narrative of the tapestries. Perry's sketchbooks are a delight. In these he developed the themes, the storyline and finally the sketches for the tapestries. Plus added annotations about the artwork and notes of key themes for individual tapestries. Superb illustrations of both tapestries and details. each individual tapestry enjoys a folded panoramic pullout - which means we get to see them very much bigger than the size possible on a conventional page. Plus details enable one to see the way the tapestries are woven and how the colour transitions work - which is an aspect I found particularly interesting - scumbling on a loom! Plus who knew that looms are now digital and can produce a large tapestry in about 5 hours? Fans of Grayson Perry - whose fan base seems to be increasingly exponentially. He's on his way to becoming a "national treasure" if not there already! The Arts Council Collection have created an app for iPad and iPhone. This gives you commentary on Perry's perspective, details art historical references and provides a guide to the making of the works. You can see the tapestries up close with detailed zoom facility and have Grayson's own audio guide. Reproductions of the classical referenced artwork are disappointly tiny. They work better when accessed via the interactive aspect of the app. The bonus is Grayson Perry reading the words associated with each tapestry and highlighting the similarities between classical painting and his tapestry. The digital guide,Grayson Perry: The Vanity of Small Differences, is available only on the App Store (£1.99). These include the following. The link in the title is to the exhibition page at that location. Sunderland Museum and Winter Garden - the location for two of the patesries on 28 June, as part of the Festival of the North East which celebrates the return of the Lindisfarne Gospels to Durham Cathedral. It is of particular significance that the works begin their public tour in Sunderland as this is where Grayson sets two of the tapestries, The Adoration of the Cage Fighters and The Agony in the Car Park. Perry’s own edition of The Vanity of Small Differences was displayed as part of the Royal Academy of Arts Summer Exhibition 2013 (June - August 2013) - see my review 10 reasons to visit the RA Summer Exhibition 2013 - my #1 reason was the set of tapestries which got a room to themselves. Leeds City Art Gallery (1 August – 1 October 2014). An international tour will follow. This review kicks off the The Big Drawing Book Review 2013 - which I introduced on my main blog Making A Mark. It follows on from The Big Drawing Book Review in 2007. There have been so many new books in the intervening years I thought it was time for another one! You can find out how you too can participate by reading my introduction blog post (see first link above). It seemed appropriate to start with a book which encourages people to draw. 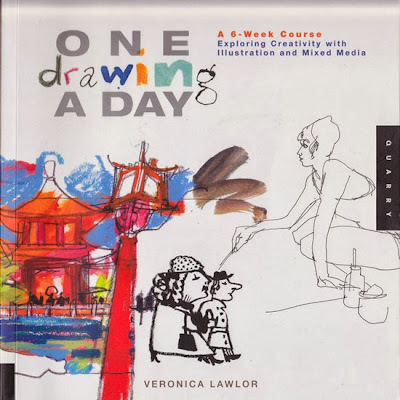 This then is a review of One Drawing a Day: A 6-Week Course Exploring Creativity with Illustration and Mixed Media by Veronica Lawlor. The key distinction of this book is that it grew out of a blog created by professional illustrators and art educators which has been more or less posting one drawing a day each month since June 2009. Synopsis: This is a structured daily drawing course exploring creativity with illustration and mixed media which allows you to pick and choose the order that you complete the work. The author proposes readers should do 42 daily exercises - one drawing a day - over a period of 6 weeks. Drawing is a euphemism insomuch as in this book it also involves sketching with paint. The focus is on expressionism rather than realism. A handy book to have around when your drawing goes stale. A good book to consult if you want to make progress with your drawing without going to class. Provide quick tips for those skim reading! They contain some very useful information - I learned a few new things! this is the blog One Drawing a Day written by the members of an illustration collective called Studio 1482. There are blog posts most days. There is an a Flickr group - One Drawing a Day. Note that some of the people who participate are adult professional artists. Exercises may feel routine to some with a formal art education - on the other hand it’s nice to have a reminder! 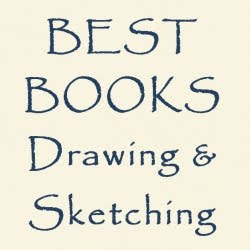 The book lacks variety in terms of different styles of drawing and sketching compared to the variety of sketches seen elsewhere in other books and other projects. Probably connected to the content having been produced by an artists’ collective (Studio 1482). Those wanting to learn how to draw - from the very beginning. I don’t think this is a beginners’ book. it assumes a lot of prior knowledge of art materials and that you will “get on and do” on your own. This book will feature on a new website I'm creating. Zazzle and Fine Art America are the most popular choices of artists using print on demand services for their artwork. Print on demand is a service where you upload an image and a company fulfils all orders for a giclee print, invoices, processes payments and despatches the print on your behalf - for a fee. many artists like it as they can make money from their artwork even if the original has been sold and can spend more time on making art and less time on doing the administrative aspects. However print on demand doesn't just happen - just as with original art, you still need to work at the marketing! But which site offers the best service? 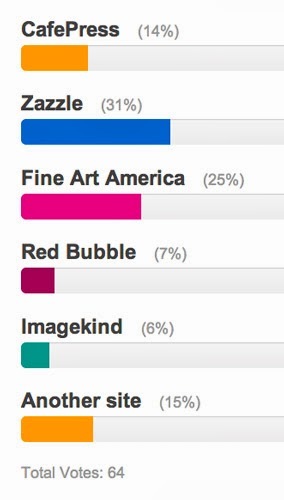 My poll which investigates which print on demand service artists like best has been running on my website dedicated to Print Art on Demand - Resources for Artists since last August. You can see it below. POLL: Which "Print on Demand" site for art prints do you like the best? The poll ran for 13 months between August 2o12 and Sepetmber 2013. I'd have liked the poll to have been bigger - that said it still represents responses from 64 people, some of whom have also left comments on the website. a quarter opted for the services of Fine Art America. Upon further investigation, while there's not that much to choose between them in terms of traffic in the summer months, Zazzle absolutely thrashes CafePress at Christmas with some 2 million more visitors (9+ million compared to CafePress's 7+ million). So if you want customers for your art at Christmas you might want to give Zazzle a try. Zazzle also has the snazziest looking website - which is bang up to date. It's already got its offerings up re. 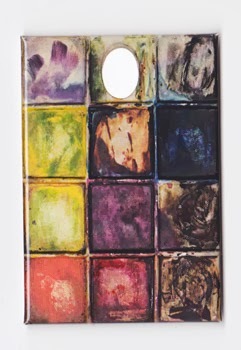 putting artwork on the new iPhone cases on its home page! Redbubble is close to the Zazzle and Cafepress end of the market - however the general consensus is that this once popular Australian based firm has maybe peaked. It's been giving an impression of a site which lost its way in business terms. The website also has a more conventional look about it. A number of people have been looking for other venues since they changed the way they do business. Fine Art America is a more popular choice for those wanting to sell fine art prints of their artwork on demand - with the company doing all the necessary to fulfil the order. One of the aspects artists appreciate is the fact that they can choose whether or not Pinterest can pin their images or not - it's their choice, not a choice made for them by the website. What I like about Fine Art America is that all the basics are explained - with a decent amount of detail - all on one page. You also have the chance to sell prints direct from your own website. With a premium membership you can also sell your art via Amazon.com. On the other hand, its sop site is by far the most traditional looking and is likely to attract an older customer. In my view, Fine Art America could do with reviewing how its site stacks up compared to the competitors. My original choice of website for prints (Imagekind) was spot on in terms of quality of print - and absolutely dreadful in terms of their business model and their overall approach to growing the business. So while you can see my prints via my website I have been giving some thought for a while to switching to a new provider. I'm not really into selling mugs and mousemats so I'll probably skip Zazzle and give Fine Art America another close look. I'm also going to check out some of the photography websites which have well organised ecommerce options and will then review the options. One thing I would say is if you've not given ALL their websites a once over for quite a while, I think you'll notice quite a bit of change. Maybe time to take another look? 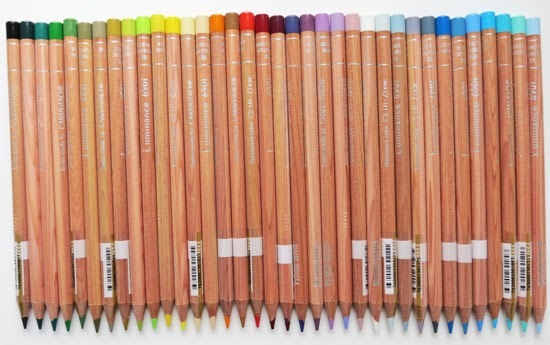 A lot of artists I know are very fond of collecting trivia which is artist related - and this is a post for those who have a tendency to buy art tools on items wholly unrelated to the studio. Those clever people at the National Portrait Gallery shop have been exploiting this tendency of late with a fantastic range of goods based around a colour chart and a palette. In this post, you can see the two items I bought this summer - and am very happy with. However I can't identify them in the shop and am wondering if either they are now only available in the shop - or they've sold out! For the record: the colour chart coasters were £14.50 and the artist's palette fridge magnet was £3.50. They're suitably practical to justify the price while being a great deal more attractive and appealing to me than alternatives fulfilling the same function. The palette is actually based on George Johann Scharf's small china palette and is 19 x 15cm. Scharf was a German artist who chronicled 19th century London - which you can read about in this blog post. There's also a small Small China Palette brooch of the same design available from the website. 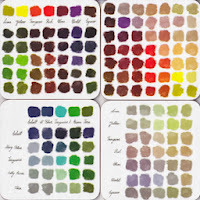 Plus links to more of the same in terms of the colour chart design - but different online. I'm very taken with the Colour Chart tea towel. 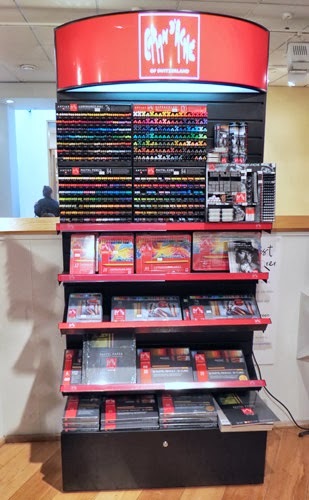 I do like the National Portrait Gallery shop - and I highly recommend it for a browse if you're in this area of London with a few minutes to spare. They have a habit of coming up with items which are slightly quirky and better quality than one might find elsewhere. Some are somewhat highly priced but if you pick and choose you can have a small indulgence for not very much at all! 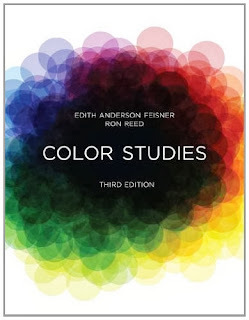 A NEW 3rd Edition of Color Studies by Edith Anderson Feisner and Ron Reed has just been published in the USA (21 August 2013). It should be available in the UK in either September or November depending on which reference source you read. It's even worth buying just as an investment! Without even having seen it, the value at which the 2nd edition (which I own) now trades for on the Internet suggests that this 3rd edition should be snapped up immediately by all artists who like owning very good books about colour. This is the book I always used to recommend to people wanting a complete overview of Colour as a topic for artists prior to the publication of Colour and Light by James Gurney. 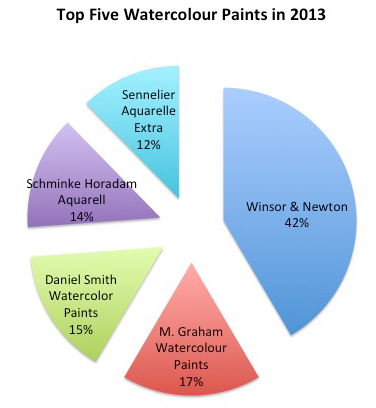 Feisner and Reed provide an up-to-date discussion of sustainable color applications and green materials as the underlying component of colorants, dyes, and inks in textiles, printmaking and paints. A new chapter on color and digital technology discusses illuminating with color (LED), color tools and management (Pantone), as well as color consulting and marketing. 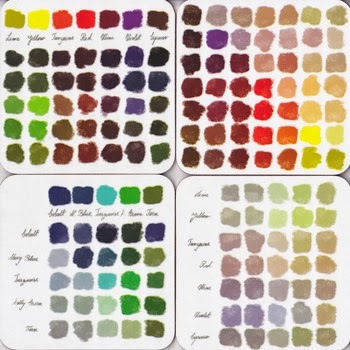 a historical account of pigments and their use in fine and applied art plus a list of historical colour palettes linked to current colour code. color legibility rankings (background colors and lettering/line colors) Did you know that the most legible background colour is yellow? Details are provided by Bloomsbury Books in the UK. It's being published as a Design Book. Edith Anderson Feisner - a Visiting Specialist / Assistant Chair (Retired) in the School of Fine Arts at Montclair State University, USA. She has taught courses in color, design, and introduction to visual arts. She has held many positions in the Embroiderers' Guild of America including certified teacher, teacher certification board, as well as the author of the master craftsman programs in color and design. Her fine art works are in both public and private collections. Ron Reed - an Assistant Professor and Program Coordinator for Interior Design in the School of Family and Consumer Sciences at Texas State University-San Marcos, USA. Reed served as the IDEC Southwest Regional Chair between 2011-2012.